i) Vessel characteristics, including principal dimensions, tonnage, location of draft marks, builder, official and registry numbers, etc. ii) Instructions for use of the nomograms, curves, and other data in the booklet to calculate stability and trim of the vessel for given loading conditions. iii) General operating instructions and precautions. iv) Tabulated tank and hold capacities. v) Hydrostatic properties (KM, LCB, LCF, etc.) tabulated or plotted as a function of mean draft. 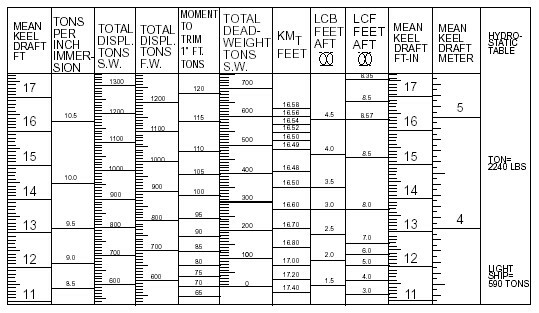 vi) Metacentric Height (GM) diagram, showing GM for tabulated conditions of loading and minimum required GM for vessel service. vii) Trim diagram to calculate vessel trim when weights are added at locations other than the vessel center of gravity. viii) Weight distribution and stability information for various conditions of loading. ix) Liquid loading diagram, showing the location, capacity, and effect on list and trim of the ship’s tanks. Figure shows a typical hydrostatic table.